During the Consumer Electronics Show in Las Vegas, Dominic Raad and I attended Sprint’s Hottest Spot 4G event. Although we arrived late since Microsoft’s Press Conference lasted longer than expected due to a power failure, we still made it to the event. Steve Ballmer made it to the stage and presented to the audience at Sprint’s event immediately after his own keynote even though we didn’t make it there on time. Sprint’s CEO, Dan Hesse, hosted the event and Best Buy’s CEO, Brain Dunn, joined him on stage as well. 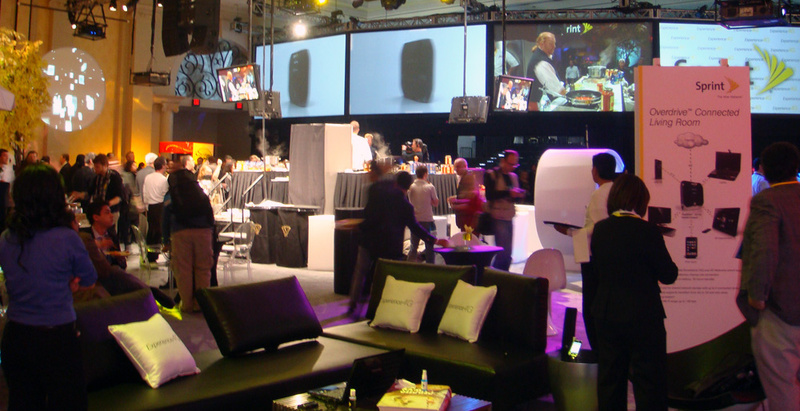 The topic was of course their new 4G offerings and a the new Overdrive personal WiFi hotspot, much like Verizon’s MiFi. Sprint’s Overdrive is the first 4G-powered mobile hotspot. All predecessors from other carriers have only supported 3G networks to date. Sprint’s 4G coverage extends only to 27 markets at this time, but they’ve announced plans to expand to Boston, Huston, New York, San Francisco, and Washington D.C. this year. You can check if you are in the included coverage area here. 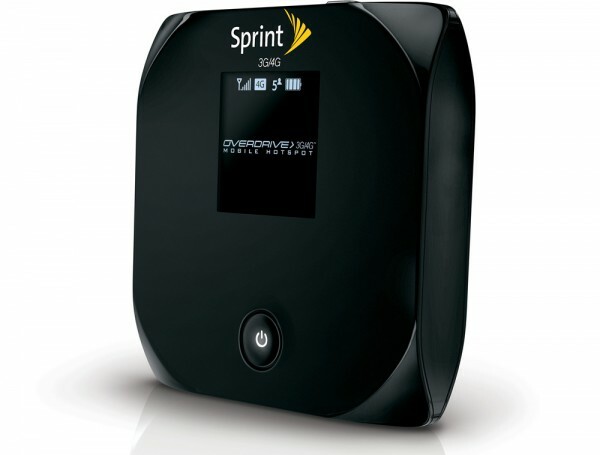 Fortunately, the Overdrive is entirely backwards compatible with Sprint’s 3G network as well. Although slower, it’s widely available nationwide. So here’s how it works. Just press the power button and wait a few seconds for the device to turn on, connect to Sprint, and start the local hotspot. The SSID and secure key appears on the display. Just turn on any WiFi enabled device such as a Laptop, Netbook, Sony PSP, Nintendo DSi, Zune, or iPod Touch. (Even works with the iPhone’s Wi-Fi if AT&T’s network is being spotty.) The Overdrive allows up to five simultaneous connections. Portable hotspots, unlike embedded mobile broadband chips and external USB cards, offer the freedom to share internet access with more than a device. 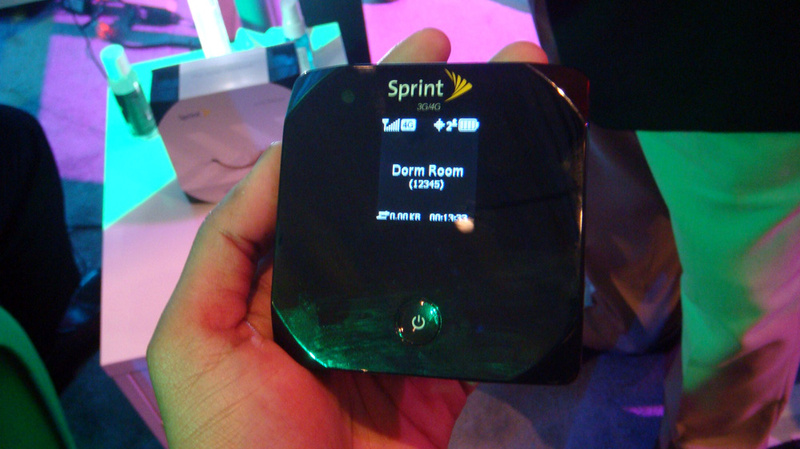 Sprint was kind enough to lend us a 4G mobile broadband card while we were in Las Vegas for CES, one of their 4G markets. Although I’ll leave the details in the full review of the U300 4G card, speeds often reached up to 6MB/s. (Theoretically 10Mb/s!) That’s faster than many home DSL lines and is plenty of bandwidth for streaming music from Pandora, videos from Hulu, and Skype video calls. Sprint has sent us a sample unit for a full review, but it’s still in transit. However, a couple of unique features worth mentioning now. The Overdrive has a microSD card expansion (16GB max) to create a mini network shared drive for connected devices. The LCD displays active users, signal strength, battery life, and a few more details. Sierra Wireless, the manufacturers of the Overdrive, claims a 150 foot WiFi range. In regards to battery life, it’s expected to last up to 3 hours in use and 36 hours on standby. If you run out of juice, there’s a microUSB cable to recharge the device. The device just hit stores on January 10th and will run you about $99 after signing a two-year contract and sending in a $50 mail-in-rebate. For more details on this and to read our full review, stay tuned. You can subscribe to our RSS Feed or sign up for Email Subscriptions. If you haven’t heard, we’re also on Facebook and Twitter!